The shiny things are two lone-star charms (I likes shiny things). Riddle me this: why is it that someone I’ve never met, and who lives thousands of miles away, can knit a pair of socks that fit me perfectly, yet I can’t? Thank you Chris (Skittermagoo). Can you beleive that these are Chris’ first ever cables?! You rock! Now, I just have to check that my pal got hers! You’d think that the Royal Mail would be able to deliver a pair of socks to …. somewhere else in the UK??? EDIT: so, she got them and guess what? They don’t fit :((((( They measure 6 1/2″ instead of 9 1/2″. What the hell did I do!? Did I not measure them correctly? Did I get my nines and sixes mixed up on the tape measure? Did they shrink a lot when I washed them? Quite frankly, any or all of these are a possibility. Anyway, they fit her daughter perfectly and she loves them (so not a total waste then). Don’t worry: they are only my high-tech, super-expensive stitch markers. I’ve actually finished the shawl and I’m just about to start blocking it. 36 hours it took me to cast off – not really! I did the casting off in hour-long bursts over one and a half days, but it felt like 36 hours! The good thing about finishing the shawl is I now have two 70 g skeins plus about 20 g remaining of a third. So, I’m thinking SOCKS! I hope suggestions will be forthcoming for suitable patterns (I’m thinking maybe lace would be good) and also suggestions as to needle size. The reccommended size on the ball band is US 4s (about 3.5 mm) and I usually go down half a millimeter or so from what you’d knit a jumper on. So that would be US 2 or 3 (3 or 3.25 mm). Sound about right? Everything is parcelled up and ready to go. I’ve included a print out of two landmarks around my way: the local town hall (better than it sounds) and a really beautiful lake just up the road. I also included the rest of the yarn that I didn’t use and the Lava Flow pattern. Thanks for the comments on the socks – I’m now just hoping that they fit the recipient! I need something plain and simple to work on next (since it’s lace, texture and cables on the needles now or will be soon), so I’m planning on Picovoli sans pico. Obviously, I’ll have to change the numbers to make it work with my yarn, but I’ve done that before and I “heart” maths! no assignments + cricket = mucho knitting time. Stick a fork in them (or two ciruclar needles), they do be done! I liked this pattern and think it works really well with a regular-striping yarn like the Regia Mini Ringel I used. I worked the grafting using the instructions I found here. I am so chuffed with it you wouldn’t believe. In fact, I may have to break out the happy-dance bunny! I didn’t have 1, but I did have 2 and 3. The colour moves from copper, to yellow, peach and khaki green. I love it! The name for balls I made is “cheeses” – hence the title. I think “slowly but surely” would be a good truism to attach to these socks. I like the pattern and I love the fact that I’m knitting them for someone I’ve never met, but there’s no shaping, no yarn overs, no cabling, just a “slip one purlwise” every five stitches. Thanks go to Bagpuss for ably modelling the socks! Just in case you think I’m completely mad (you didn’t already?) he is a pyjama case as well as being cute! Plus – no claws to dig into my knitwear! I’m now just one and a half inches off starting the toe, so I should be finished in time. Good news for my sock pal! I’ve had the pattern for ages (and the yarn for even longer) and I hope that this will be the year I’ll finally cast on! 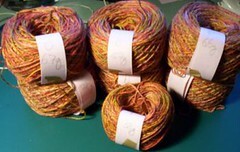 The yarn I have is the discontinued Rowan Magpie Tweed in the colourway Jewel. It’s purple with little flecks of red, green and brown in. OK, not really my first cardigan, but it will be the first cardigan I’ve designed wholly from scratch. I’m using Knitting from the Top for the instruction part of it and the Harmony Guide for Aran Stitches for the cables. It will be a saddle-shoulder, round neck cardigan for my mum in a cotton/acrylic yarn from Elann. I’ve got a 3000 word infectious disease essay to do this week and then my final, final, ever assignment next week. After that, I’ll collapse in a jibbering heap for two day before starting on my revision. Oh joy. See you the other side of leishmaniasis!